Journey from the lush Top End, through the fiery Red Centre, to the stunning coastlines of South Australia. Exclusive to Holidays of Australia and the World. Search for saltwater crocodiles and colourful birdlife on your Yellow Water Billabong cruise. Witness the stunning Remarkable Rocks on Kangaroo Island. Get up close with koalas, see penguins swim and play, hand feed kangaroos and wallabies and interact with snakes and crocodiles. 1 night stay in Darwin at the DoubleTree by Hilton Esplanade Darwin including breakfast. Overnight Kakadu & East Alligator River tour including 2 lunches and accommodation at the Mercure Kakadu Crocodile Hotel. 2 night stay in Darwin at the DoubleTree by Hilton Esplanade Darwin including breakfast. Transfer from your accommodation to Darwin Train Station. 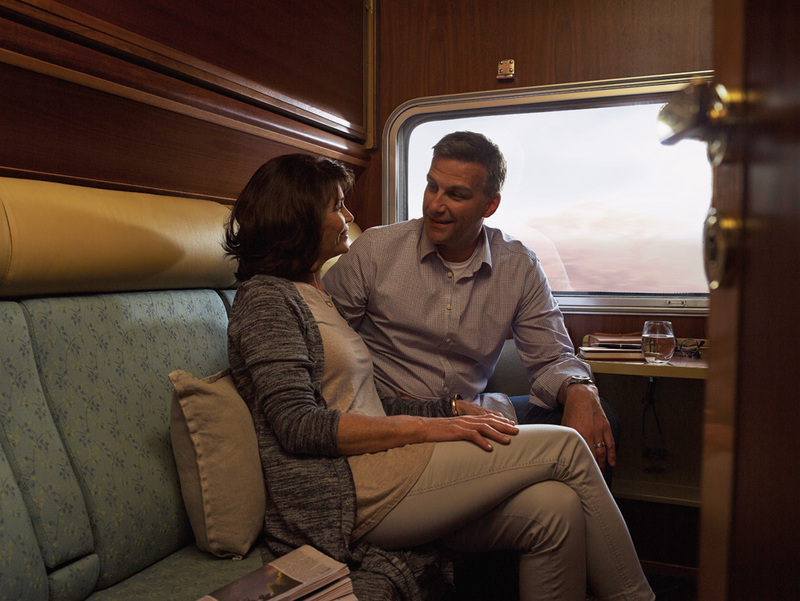 3 nights on The Ghan Expedition travelling from Darwin to Adelaide in Gold or Platinum Service. 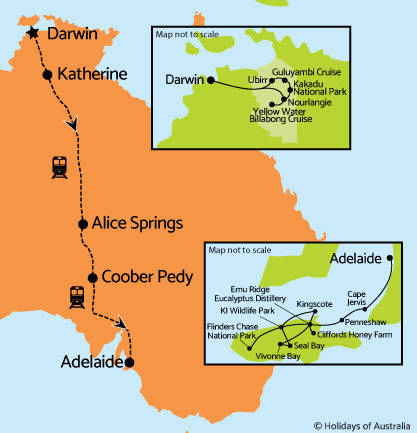 Your journey includes all meals and drinks and off train experiences in Katherine, Alice Springs and Coober Pedy. Transfer from Adelaide Parklands Rail Terminal to your accommodation. 2 night stay in Adelaide at the Hilton Adelaide including breakfast. Overnight Best of Kangaroo Island tour including accommodation, touring, breakfast and 2 lunches. 1 night stay in Adelaide at the Hilton Adelaide including breakfast. ^Save $700 per person based on everyday fare twin share, other discounts apply for different fares. Available on new bookings only, discount has been applied to pricing and is valid for sale until 1 June 2019 for travel between 1 June - 31 August 2019. Spend hours deep in conversation with a travelling partner or lose yourself in a lifetime of thoughts.